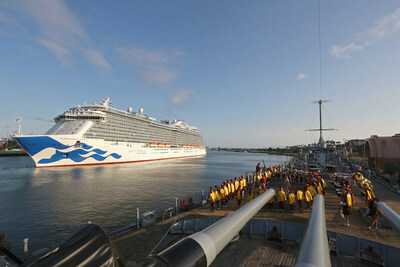 SANTA CLARITA, Calif., March 24, 2019 /PRNewswire/ -- At the Port of Los Angeles today a Royal Princess arrived ? that is, the 3,560-guest Princess Cruises ship ? now here to take travelers to sought-after destinations including the Mexican Riviera, the California Coast and Alaska. In celebration of Royal Princess' maiden call to the Port of Los Angeles and the cruise line's biggest West Coast cruise season, a "Royal" fanfare marked the occasion highlighting the arrival of one of Princess Cruises' newest and most elegant ships. Guests and well-wishers were then treated to a fireworks display as Royal Princess departed on her very first seven-day Mexican Riviera cruise ? the same itinerary made famous by Princess and "The Love Boat." Award-winning features aboard Royal Princess include the large atrium or "Piazza," offering enticing entertainment and culinary delights; the overwater SeaWalk ? a 60-foot-long glass walkway standing 128 feet above the ocean; an expansive Lotus Spa and adults-only Retreat Pool and Sanctuary. Additional photos can be downloaded here. Princess Cruises continues its multi-year, "Come Back New Promise" ? a $450 million-dollar product innovation and cruise ship renovation campaign that will continue to enhance the line's onboard guest experience. These enhancements result in more moments of awe, lifetime memories and meaningful stories for guests to share from their cruise vacation. The product innovations include partnerships with award-winning Chef Curtis Stone; engaging entertainment inspired shows with Broadway-legend Stephen Schwartz; immersive activities for the whole family from Discovery and Animal Planet that include exclusive shore excursions to onboard activities; the ultimate sleep at sea with the award-winning Princess Luxury Bed and more.